After two years in the Midwest and three years in the East, the DCI World Championships moved to Colorado in 1977. The Prelims took place at the University of Colorado in Boulder, and the Finals took place on Friday at Denver's Mile High Stadium, which has since been torn down and was next to the current NFL stadium that hosted the 2004 DCI World Championships. The 1977 Finals were held on a Friday because the American Legion had already reserved the stadium for their own National Championships on the following day. Blue Devils won their second title, achieving perfect scores in Brass Effect and Percussion Effect, and they were just 0.10 away from a perfect score in Visual Effect. Among the firsts that year was the entry of Crossmen into the Finals, the appearance of a parachute that swallowed the entire Seneca Optimists, and Garfield Cadets' vocalization of "Amen" at the end of the their closing piece, "Jesus Christ Superstar." The corps managed to pull that off because although singing wasn't illegal at the time, as it was the following year by DCI rules, there was no clear rule banning it in 1977. Blue Stars' sixth-place show started with the corps entering the field while facing backward during the start of a medley of three traditional Jewish folk songs. "Shema" is the basic principle of Jewish belief, a prayer recited twice a day by adult Jewish males, proclaiming the faith of their people in God. "Hatikvah (The Hope)" was the unofficial national anthem of Israel until it became official in 2004, words written in 1878 by a Jewish poet in what today is Ukraine and music derived from a 17th Century Italian song that became popular throughout much of Europe. The medley ended with "Hava Nagila," the best-known Jewish melody sung in Hebrew. Literally meaning, "Let us rejoice," the melody was derived from a Ukrainian folk song. During this movement, the color guard members laid their flags and rifles on the ground in the shape of a six-pointed Star of David and performed a rendition of a traditional Jewish celebratory circle dance. "The Planets" is a seven-movement orchestral suite that English composer Gustav Holst started writing in 1914. It was premiered in England during the last weeks of World War I. The suite was originally scored as a piano duet, except for "Neptune," which was originally written for organ. The corps performed the famed "Jupiter, the Bringer of Jollity" and "Uranus, the Magician," the latter starting with a percussion feature, ending the work with the finale from "Jupiter." The peppy "Backwoods Sidemen" came off Buddy Rich's "The Roar of '74" big band studio album, the same album that brought drum corps "Nutville" and "Waltz of the Mushroom Hunters." Opening with a rather challenging mellophone duet, the piece ended with the color guard rifle bearers opening and closing red and white umbrellas to the repeating crescendos in the music. The corps' closing piece was Charles Smalls' "If You Believe" from "The Wiz," a smash hit 1974 musical that updated the classic story of "The Wizard of Oz" story, setting it in a contemporary African-American environment. The corps' rendition came a year before the musical was made into a movie, the song memorably interpreted in the film by Lena Horne. During the climax of the piece, the corps formed a five-point star, which has often been seen in Blue Stars shows. As it had been for the previous two years, Bob James' "Soulero" provided an extra tag ending to the show. The work, off his 1974 debut solo album, "One," was inspired by the famed "Bolero" by Maurice Ravel. "One" is considered by jazz historians to be one of the most important albums in the early days of smooth jazz. By 1977, Blue Stars and Santa Clara Vanguard were the only two corps to advance into every DCI World Championship Finals. 1977 finalists Madison Scouts, Kilties, Cavaliers and 27th Lancers had each fallen out of the top-12 once and Bridgemen didn't even go to the 1975 show after plummeting to 26th place in 1974. 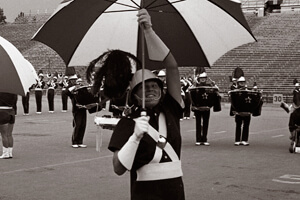 Garfield Cadets missed four of the first five years of DCI, and the other five corps in the 1977 Finals didn't make the top-12 until 1974 and 1976. 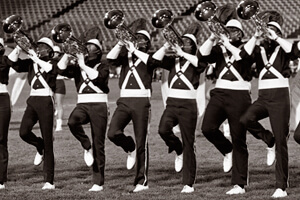 In 1980, Blue Stars would slip to 13th, and after several successful years in Division II & III competition, wouldn't return to the Finals again until 2008. For this week only, you can save on the Legacy Collection DVD that contains this complete Blue Stars performance, along with all finalists from the 1977 DCI World Championships. Discount DVD offer ends Monday, June 3 at 8:30 a.m. ET.